Antiques experts Christina Trevanion and Charlie Ross begin the final day of their road trip in the town of Spalding, before heading towards Boston. with experts Christina Trevanion and Charlie Ross. I don't intend to miss you, because I'm going to stay with you. Wild horses will not remove me from you! and can spot a bargain from miles away. is on a song this week. Our pair kicked off with £200 each. and has £232.06 to spend. You've got your work cut out, honey. I've seriously got my work cut out. I think you're the sort of girl that could handle that sort of challenge. in a 1977 Volkswagen camper van called Geoffrey II. I think we ought to buy Geoffrey a present. to the coastal town of Boston in Lincolnshire. and heading to the final auction in Boston. How do they "tork" in Norfolk? They "tork" like "thart" in Norfolk. I say, chaps, I'd work on the accents. Last time I checked, Norfolk wasn't in the West Country. and this maritime past is still very much in evidence today. -Well out of your price range, dear. Goodbye. This looks just up your street. Even I might not have enough money! Nothing that I can see anywhere near my miserable £340-whatever. But if I keep looking, there might be something. Time to get owner Arthur involved. -I need to find something out of your sphere, don't I? Nothing I can teach you about Georgian furniture, I can tell that. That's not really you, is it? -No, no, not really me. What are you doing with a bit of bamboo? Well, it's not a bad bit, is it? seems to be in Charlie's taste. It's a love it or hate it. this would be a huge gamble. The bad news is, Arthur, I don't really want to pay £200 for it. Oh, don't be like that! Would you take £100 off an old man for it? -What about a young man? -Not even an old man. Not even a young man. What?! Not even to our Charlie?! Looks like you'll have to keep looking, Rossco. Arthur, may I borrow you again? -I've seen something at long range, here. Bit of chinoise with the stool, how much is that? Steady on, you'll do yourself a mischief. and had a look at it. Chinese Chippendale. ..what Christina would call "Chinese Chippendale effect". Or style, for you, Christina, cos it isn't period. so it could be a real gamble. Well, it's cheap enough, innit? I must say, Arthur, your starting price was almost...reasonable. No, it's not the starting price. -That's the death of it, that is. -That's the death, is it, 50 quid? Hmm, you're not dancing now, though, are you? I suppose the only thing about that at auction is who would buy it? I suppose it could make 20 quid and it could make 70 quid. It'd be a complete gamble. to see what John has to offer in Spalding Antiques. A pearl missing out of that one, but a little diamond, OK. He looks a bit of a skew-whiff spider, doesn't he? Yeah, it does a bit, yeah. -But it's nine-carat, I think. How much are on your brooches, John? and nine-carat gold spider brooch. -What's best, best price on that? That, really, I'm not particularly interested in. it's got a stone missing, it's a bit damaged. but, really, I would be wanting to pay £30 for the two. I would do them at 40. You are generosity personified, sir. Thank you very much. That's half of John's original asking price. Nice work, girl. Back in King's Lynn, how's Charlie doing? I would lose money at auction. How much did the stool cost? We might do a deal. Could you do two for the price of one, do you think? What, £200 for the two? That's the very best, isn't it? There's not a penny to be had off that, is there? -you would find that acceptable, would you? Put it there. I'm going to give you £200 for those two. let's hope your luck's returned, Charlie. to learn about an ancient and traditional way of life. to document their fascinating past at the Gordon Boswell Romany Museum. -Nice to meet you. Yes, Gordon. -Christina, lovely to meet you. Gordon began the museum with his own family's caravans back in 1995.
in memory of his father, Silvester. -The proper word for these is "vardo". a caravan, something like that, but the proper word is "vardo". Can I have a look in one? did you start out in one of these? -I was born in a tent at the side of one of these. so this is how I've started my life off. That explains to me why you collect these, then. This is nostalgia for you. People say, "How did they live in here?" -So what date would this have been? so go back to houses of 1920. -a tin bath, one bath a week. -So you've got to compare them to them days. than the average house - people who lived in houses. One particular vardo in the collection takes pride of place. So whose vardo was this? and to keep his hand in. There's five boys and two girls, seven of us. -So seven, plus your mother? -Plus my mother was nine. Was it a way of life that you enjoyed? Was it a way of life that you have fond memories of? That fond memories, you'll never forget them. couldn't wait to get out of them. So why do you cherish it so much? Why do I cherish it? Well, if I didn't cherish it, what would happen to all this? You wouldn't be coming to a Romany museum, would you? It'd be lost, wouldn't it? without Christina hitching a ride. -It's a wonderful, peaceful way of travelling, isn't it? You're in a country lane and you've got no worries. to vamoose from the vardo and carry on shopping. Which is exactly what Charlie's doing. He has £196.68 left as he heads for The Old Granary Antique Centre. a familiar face is on hand to help. And Charlie wastes no time in pursuit of his third item. Where did this trip start? And what was I wearing? A kilt. Not this kilt. It's certainly not a Ross tartan. Stewart tartan, but it's got the jacket as well. Oh, lordy. I thought this was a family show. Looks like Charlie's going back to his roots again. Look at that - it's not a Ross tartan, but it's not bad. -I could start winning again. The outfit belongs to Rachel, who isn't in today. so Charlie gives her a bell. Um, it's got to go to auction. I don't see the whole ensemble making more than £60-£70 at auction. so he's back on the prowl. There's nothing as appealing as a kilt here, to be perfectly honest. Ooh, this is rather fun. a weather vane with Christina on the top. Look at her go! Look at Christina go. Charming. This weather vane also belongs to Rachel. "At 70 quid, would you chuck in the weather vane?" so Charlie makes another call. Are you sure you're all right with that? -And you're a lucky devil. The money is going on the table. Perhaps Rossco's luck has changed. -and £5 for the weather vane. -That's a celebration, girls, come on. Mwah! Mwah! I'll do a little fling. And so a busy day wraps up for our intrepid travellers. is as overcast as the weather - look at her face. Charlie, this is our last day. Can we make this day last for ever? a weather vane and a Scottish national outfit. That leaves him with £76.68 still to spend. but a healthy £192.06 to do it with. I've got some serious work to do before we part, though. I tell you what, you've got some buying to do today, my girl. You have got some buying to do. where Christina has an appointment to browse. but Christina's been on the hunt for all things sparkly. -This is my last leg. -This is my last chance to make an impact. You've got some really beautiful things. That's what we like. Ooh, OK! ..and opaline brooch, that's quite nice. OK, we've got a little sovereign case there with nice spring action. -No hallmarks and feels plated as well. Then we've got a little... That's silver. OK, so silver shell butter dish there. And again, that looks plate, doesn't it? But that's rather nice. That feels... OK, that's stamped "sterling". I like a job lot. I do like a job lot. What have you got on that? 25. I will happily give you 25 for that. These haven't been priced up because I'm not sure what they are. They might be jade, but one of them is a bit light. -Oh, it is, isn't it? Time for our expert to decide - jade or glass? I agree with you that they could and they couldn't be. Oh, yeah? Well, that's cleared that one up, then. I like them, but I like them at £40 for the two. a heck of a risk. Seeing as you're taking a risk on them, I can do that. but finally Christina's taking a risk to get back in the game. I need to, so at £40 and did we say £20? -Can we do £60 for the lot? -Yep, we can do that. -£60, thank you very much. and England became a republic. To find out more, Charlie's meeting museum curator John Goldsmith. Hello, John. Nice to meet you. during the reign of Charles I.
over the people and the Parliament. and Cromwell was about to play a significant role. Did he form his own opinions of the king in a detrimental way? Cromwell didn't certainly start off, I think, being opposed to the king. -was greater power for Parliament. which, of course, led to the outbreak of the Civil War. in bloody conflicts across the country. and within three years, he'd been promoted to lieutenant general. he manages to have both a political and military role. War raged for nine years and Cromwell became ever more powerful. Then, in 1649, the Royalists were defeated. Charles I was captured, put on trial and beheaded. and the country was left without a leader. The monarch had gone. What happened next? -What Parliament did was to declare itself a Commonwealth. It's the only time in this country's history when we've had a Republic. For four years, Cromwell is part of a republican parliament. he committed heinous atrocities in Ireland and Scotland. Cromwell becomes very frustrated with Parliament's lack of progress. Parliament really weren't doing what he wanted them to do, were they? They're not doing what he believed they ought to be doing. Cromwell dismissed Parliament and took complete control. by the man himself at the dissolution. Is there any significance to the size of the rim? ..because the bigger the hat, the costlier it would have been. with much the same powers as the monarch he had fought against. until he dies peacefully in his bed. At Cromwell's death, a death mask was taken. -and you can see clearly above the right eye a big wart. And Cromwell is said to have said, "paint me warts and all." Oh, "warts and all"? Is that where the expression warts and all comes from? -That's where the expression comes from. Following Cromwell's death, support for the republic soon wavered. and settle a score with an old foe. who were held responsible for the death of the King were to be pursued. -But, of course, Cromwell was dead. and then the head was detached from the body with an executioner's axe. So he was posthumously executed. where it stayed for the next 20 years. -Thank you very much for coming, Charlie. -looking round your wonderful museum. Christina's made her own way to the university town of Cambridge. more per head on takeaway meals than any other town or city in Britain. Huh! Let's hope Christina can take away a bargain. though it doesn't look like Christina will find any bling in here. In fact, she seems to have changed tack entirely. I quite like those, they're quite impressive, aren't they? -Let's see if we can find somebody... Somebody. Hello, sir! -Nice to meet you, Warren. How are you? Are you well? so he should be the man to help turn these planters into winning pieces. I quite like your urns, they're just quite impressive. There's no serious age to them, is there? No, but they're not, sort of, precast concrete. -Do they come as a pair? -They come as a pair, they're a matching pair. -You don't have to have them. -But there isn't a discount if you DON'T have them. -What's your absolute death on them? -they could be £20 a pair. I'll give you £20 for those. I will shake your hand, and I will give you some cold, hard cash. Can the planters make Christina a cold, hard profit? Green fingers crossed. the 19-mile journey down to Cambridge with Geoffrey. Geoffrey, it's rather lonely being just alone with you. ..are you enjoying your day, although Christina's not here? -Oh, no, you're not! No. You like it when Christina's here, don't you? Stephen, owner of Cambs Antiques. -Hi, Charlie, how are you? I've got a couple of silver bits down the front you might be interested in. -Lead on. Come on, come on! Well, this could be a stroke of good fortune. You've got a little bit of a sort of corner of excitement here, haven't you? -I have been cleaning, yes. -A pair of rouge pots. Or trinket jars. Rouge pots, aren't they? These silver-topped rouge pots are hallmarked Birmingham 1919. That's pretty. Little vesta, look at that. -And even better, this one's from Chester, dated 1907. You're going up in the world, Charlie boy! -Look - and a vacant cartouche. -You could give that to somebody. -You could get your initials on there backwards. That's interesting. It's a birthday book. -I thought that was a Bible. You don't have any other small pieces of silver, do you, anywhere? Try the front, Charlie, that's normally where the good stuff's kept. That's sweet. Jolly nice, crisp marks again, Stephen. -Love your scent bottle. Has it got any age? What a gorgeous neck. Look at that enamel. -The key here is to find that the enamel is perfect. Levi and Salaman, dated 1926. That's the most gorgeous thing. -That's one of the most gorgeous things in your shop. Well, you're absolutely priceless, not gorgeous. Let's go and have a look, Charlie. -..that would have very wide appeal. This has got lovely bright cut decoration on it. -Don't know where we're going on pricewise, here. and a charming silver-covered birthday book. Have you got one last little bit of nonsense? -I could go £76.68 if you had something else. You'll have the blood out of the stone next, Charlie. a horseshoe brooch to the bundle. cos it says "best wishes". so Charlie gets the whole lot for £76 exactly. Shake the man's hand, Rossco! Well, Charlie's all spent out, but can Christina catch up? She's going next door for her last shop of the trip - The Hive. but has a number of silver items, too. And there's one piece in particular that has already caught Christina's eye. and I'm prepared to give you every single last one of my pennies. -I don't think that will buy that, though. Wait a minute - £72? I think you need to have a recount, Christina. I'm not used to having so much money. I might be able to afford it. Let's go and see. Go and see Bill again, see what he says. -Got a little bit of a confession to make. It's great news - I've got more than I thought I had! That'll be the mirror back in play. It's Edwardian style, but it's got no age to it. Impressive, though. What else do you want to have a look at if you've got slightly more money? -cos I only want to buy one more lot. -Again, not terribly old, but it's got the look. The 6p is still there. -What's your thoughts about the two of those for £112.06? Yes, go on. Definitely, now. Thank you very, very much. I will give you everything that's left. I've finished! That's it, I'm done! Ha ha! Good on you, girl. Shopping's done, but what did they buy? But what do Charlie and Christina think of each other's buys? Very wacky. What was he thinking with that overmantel thing? She's going to make a profit, quite a good profit, I think. And I've bought one or two safe things. this final leg of our trip concludes at an auction show down in Boston. Boston is a small port in the flatlands of Lincolnshire. to represent the Netherlands when they couldn't get the real thing. -I don't want it to end! Boston Auctions, a family business offering weekly general sales. They also auction over the phone and online. -I'm shaking like a leaf. -Forward to battle. Oh, it's freezing! Come on! Putting our pair under the hammer at today's auction is Graham Summerfield. I think those'll do very well. The chair. The chair, the stool, it isn't particularly a good example. You might get £10, £15 on a good day. I'm hoping I'm wrong, but that's what I think you'll get. nearly £115 behind in the trip, but she'll be happy with that news. -I feel like the condemned man. I've got a cheeky bid of £8, but it's a start. Have I got a ten? It's more than you paid for it. £8?! Internet, 12. 12. Look, the Internet's going. 15, 18, 20. 20 on the internet, is there 22? £20 on Internet, is there 22? 22 in the room. Have I got 25? -22 in the room, is there 25? 25 I've got, is there 28? It's a nice example, have I got 28? That turned a profit at a breeze! -I've made a profit, I've made a profit! Now for Charlie's Scottish national dress ensemble. It brought him luck in Scotland, but will it in Boston? I will start at £20. Is there a little bit more? Have I got 22? 25, is there 28? 28 I've got, 30 in the room, 32 on a commission. Have I got 35? 35 on the internet, have I got 38? 38 there is, is there 40? 40 on the internet. 42? 42. Have I got 45? 45 with the lady, have I got 48? 45 sitting on my left there, is there 48? Dress it up any way you like, that's a loss. -It's all gone pear shaped. It's fine, it's fine. Think positive. It's Christina's first chance to close the gap on Rossco. -I've got a cheeky bid of a tenner. I've got to start somewhere, I'll start there. Have I got 12? -12 on the internet. 15. £30 on my left, have I got 32? -32 I've got at the back. 35. Is there 38? 38 right behind you. 40 on the internet. 42? 42 sitting down. Have I got 45? I've got 48 on the internet. 55 there is, is there 60? 55 on the internet once. Have got 65? 65 I've got. Is there 70? 65 on the internet, is there £70? -Your last and final... 70 I've got. Is there 75. £70 with the gent in the centre there. Is there 75? -I don't know why I'm excited, they're yours! -I've actually made some money! Final chance, I'm going to let them go at 70. -A cracking profit to start with. That's taken a large bite out of Charlie's lead already. the auctioneer things his next lot, the chinoiserie stool, will flop. I've got a very low bid of £7. Eight on the internet. Have I got a tenner? -Ten at the back. Have I got 12? We'll be paying you to take it. 12, I've got. 15, I've got. Is there 18? Nope, sold for £15, I'm afraid. An even bigger loss for Charlie. Oh, dear. It's going well this, isn't it? This is going crackingly well. Christina's next up with her silver and jewellery lot. She'll be confident that this should go down well here. Start the bidding at 45, 48. 50 on the phone first. Have I got 55? £55 anywhere? 55. I've got 60 in the room. 60 with the lady. 65 I've got. Your last and final at £70. It's going to be sold. On a commission bid at 65. That commission bid has put Christina in the lead. How exciting. That's really good, isn't it? I can start the bidding straight in at 48. Have I got 50? Your last and final at 60. I've got stand in. Have I got 65? 60 in the room first. £65 anywhere? Anybody at 65? Is there 70? £70, I've got. Ouch. Christina's first loss of the day, but it's a big one. -Yes, see, that's all my profits. More like a £50 off, Christina. and scent jar are a bit of quality. -I'm nearly into a profit. 95 right at the back. £100. I've got £100 with the lady in the centre. Well done, Charlie. Quality items will always sell. -It's not all over yet, madam. Christina did well in the last auction with her brooches. 55. 60 I've got on a commission. Have I got 65? You are bidding on two, folks, not one. There's two in the lot. Your last and final at 65. Not quite the profit you need to get back in front, I'm afraid. It's Christina's last chance to catch Charlie. The auctioneer thinks her beads are jade. 38, I've got. It's your bid. Have I got £40? you should be paying double that for one of them. Don't you start saying things like that! 45. Have I got 48? 48. 50? She's a bit excitable today. £50. Have I got 55? £50 standing right at the back by the heater there. Have I got 55? but it's all down to their last lot of the day. but his bamboo overmantle is a risky choice. I've got a cheeky bid at £70. I'm going to start there. Have I got 75? 75, I've got. Is there 80? It's worth a lot more, folks. Your last and final at £80. It will be sold at 75. I think you can tell what that stonking great loss means. Come on, then. You're driving. I'm sitting in the back, my lady of leisure moment. So, after that exciting decider Charlie has slid into second place. He started this leg with £346.68 and took a risk too many. Making a loss of £116.40 after auction costs. And so ends the trip with £230.28. Christina started this final leg with £232.06. And made a steady profit of £26.24 after auction costs. She's finished with a grand total of £258.30. Well done, Christina. And now the end is near, but what a trip it's been. we've witnessed an entertaining expedition for antique glory. Oh, dear! Showing a bit of thigh there. -..versus Paul Laidlaw, antique inspector. My mind will be with me in just a second. 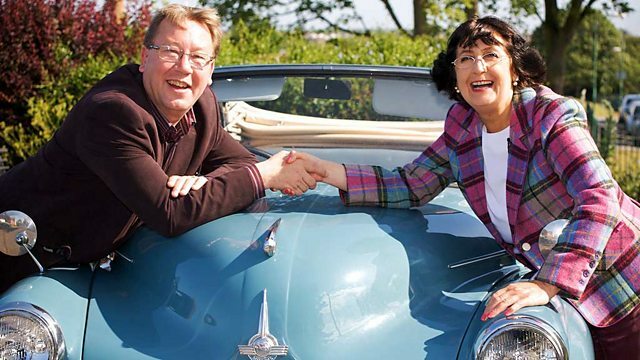 Antiques experts Christina Trevanion and Charlie Ross begin the final day of their road trip in the town of Spalding, before heading towards Boston. Christina has been closing in on Charlie's lead but who will win as they go head to head at the final auction?